This year’s Fall Kick-off Tournament only had 72 participants, but you wouldn’t have been able to tell that from the crowds at the tournament. There were quite a few people I talked to who showed up to watch the matches because they couldn’t participate because of work or their children’s schedules conflicting. There was also a pretty good sized group of new players who did very well in their respective divisions. This year’s Fall Kick-Off tournament had several marked differences from previous years. The tournament director, Pat Lew, provided some great coupons to get a free meal from Todo Mexico up the street, had Elliot Crosby bring in his mobile BBQ setup you’ve seen at the WRA picnic and other tournaments in for lunch on Saturday, and also had a very nice selection of fruit, veggies, and other snacks during the rest of the tournament. Thanks to Max Technologies, Pat was able to offer cash prizes in the Men’s Open division, which drew in several notable open players. While the tournament was still held primarily at the Bally’s Total Fitness in Lynnwood, on Saturday the tournament also had two courts over at the Harbor Square Athletic Club to handle an unexpected court closure at Bally’s. Bally’s, as always, was very flexible with their hours when things ran a little late Saturday and kept the lights on so we could finish off the last few matches for the day. A huge thank you is due to both of the clubs for making this event such a success. 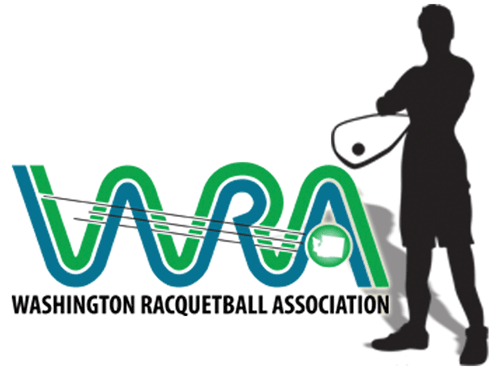 In the Men’s Open division, Jimmy Lowe (Ranked #39 Nationally according to USRA) defeated Jeff Stark (Ranked #1 in Washington State and #90 Nationally according to USRA) with scores of 15-9, 15-10. Jeff Stark put up a valliant effort, especially in the second game when he came back from a deficit of 9-2, but Jimmy’s combination of speed and accuracy was enough to halt Jeff’s comeback, defend his #39 ranking, and allow him go home with the first place cash prize! Paul Jubles defeated Neal Jentsch in three games (9-15,15-5,11-0) for third, and Carlos Thomas defeated newcomer Matt Gencarella from Idaho to win the Open Consolation. In Men’s Open Doubles, Jeff Stark and Benjamin Doniego took first, defeating all three other teams, followed by Antonio Lopez and James Kimball in second and Craig Allen and Tucker Leppa in third. In Men’s Elite, Mathew Porter took first, Matthew Gencarella took second, John Pruit took third. Men’s A’s was won by Favian Elmore, Kyle Warren came in second, and Jesus Villahermosa came in third. Men’s B’s was won by Ty Sauve, Bill Cummings came in second, and Randy Sinnott came in third. Men’s C’s was won by Gary Stone, Ken Dausman came in second, and Bill Matthews came in third. On the Women’s side there was unfortunately a very low turnout, and only the Women’s B singles division had enough entries. In Women’s B Singles Jennifer Bean came in first, Winnie Brumsickle came in second, and Karen Jaskolka came in third.